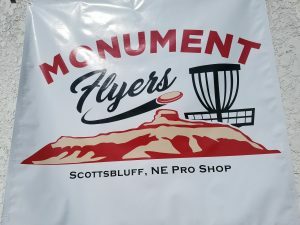 Monument Flyers is a disc golf pro shop located in downtown Scottsbluff, Nebraska. Our love of the sport is what motivated us to pursue this endeavor. We play disc golf continually and are very passionate about the sport and the disc golf community. Our goal is to provide a large selection of discs, bags, baskets, and accessories to people locally, and around the globe! Please stop in and see us if you are in the area, or feel free to contact us about our store and/or products.